"Much more that just a sticker or decal, PhantomSkinz customers have given rave reviews regarding the Carbon Fiber product line." says Patrick Dixon, General Manager of PhantomSkinz, based in metro Phoenix, Arizona,USA, "We often receive emails praising the durability and protection offered in real-world instances where our products have saved a device from certain damage." 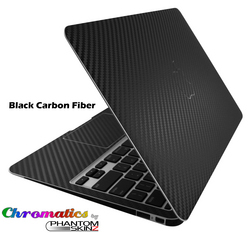 All PhantomSkinz Chromatics Full Body Protection Kits for the new Macbook Air notebooks have been specifically designed to cover the Top, Bottom and Wrist areas. PhantomSkinz protection skins leave no sticky residue, cause no damage to the device itself, and do not interfere with normal operations. Chromatics by PhantomSkinz for the new Apple Macbook Airs' have a MSRP range from $39.95 to $79.95, depending on the coverage package selected. Shop PhantomSkinz PRODUCTS for LE$$ / Full Products list Click here!